This is a graphic novel that stands out from the pack for a number of reasons, the biggest (for me) is that it steps outside the normal MO of other graphic novels which is to wallow in bad memories of dysfunctional family backgrounds and a world that doesn’t understand them. (Superhero graphic novels may well be different from this, but I’m not familiar with that world.) But this one is the supreme opposite of that – Knisley had mostly happy parents (divorced though they were), she was an only child, and grew up learning how to work happily with the environment around her, especially in the world of cooking. Knisley’s parents were both foodies with a capital “F” – one a professional chef and the other very interested in eating good food. With this support system, Knisley acquired a very open attitude towards food of all kinds (although her parents had a horror of processed junk food). So when the author was a young child, her parents were feeding her squid and mushrooms, and she acquired a wonderfully broad palate and appreciation of “adult” food. 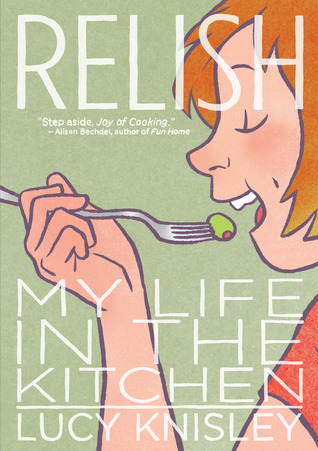 This graphic memoir details her childhood and growing up with parents who had a foodie palate and a healthy attitude to meals. Despite their best efforts, Knisley did sneak in some junk food every now and then, and although her parents didn’t embrace this, they didn’t forbid it which helps to encourage a healthy attitude to the world of eating. The author of this is an art school grad (in Chicago), and this is one of the first graphic novels where I have really noticed the art itself. Most of the time, I view the graphics as merely a vehicle to tell the story, but in this edition, the graphics are continually good, clear and cheerful. “Cheerful” is what I think I most admired about this book – I really appreciated the optimistic approach to life and the honest straight-forward appreciation of food (along with a few of her favorite recipes). She’s does a good job of sharing her enthusiasm to food and life in the kitchen, and I found myself picking up that attitude. I’m not sure that I will ever develop a love for mushrooms, and certainly not for rare-cooked lamb, but I am glad she got this published. Very enjoyable and happy read. This entry was posted in books, Non-fiction and tagged American, coming-of-age, graphic novel, humorous, Non-fiction by lizipaulk. Bookmark the permalink.